My personal opinion is our…SELF. You see, marriage is two people, with two sets of likes and dislikes, interest and passions, promising to live life as one flesh. It’s not 1 + 1= 2…NO! It’s 1+1= NEW. One flesh. In order for marriage to flourish there MUST be give and take. There is a time when SELF has to take a back seat. As we let go of the DEATH GRIP we have on “our rights” and “our individuality” and Cling to each other, we become a new entity. What I mean is…If you are a music lover and your husband doesn’t love music and feels like you would rather be listening to music than spend time with him…well, your perspective needs to change. It’s doesn’t mean turn it up louder and MAKE him enjoy it. No! It means being considerate of his dislikes and enjoy your love of music in the car, or at a quieter decibel when he’s around. For hubby, it means indulging her love for music…even if it’s not your favorite thing in the world to do! It’s just like I teach my children, “do to others as you would have them do to you.” This, of course, is scripture as well. You see, if we want our spouse to tolerate our differences and even give grace, we must walk in the same mindset. 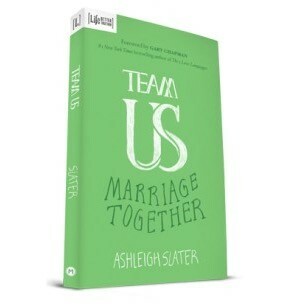 Team Us, by Ashleigh Slater is a book I just finished reading. It’s about going from 1+1 to TEAM US. It’s about compromise in marriage and how to live a rich marriage where Grace reigns supreme. Marriage will never be perfect on this side of eternity, but we can have a beautiful life when we work together as Team Us instead of trying to maintain Team You and Team Me while living under one roof. Team Us is an easy read and is intended for both husband and wife to read and discuss. In each chapter, we hear from Ashleigh and her husband, read other couples’ experiences, see how the Slater’s plan works as well as questions and discussion prompts that encourage you to sit together with your spouses to make our own plan. I love Ashleigh’s writing style. SHE’S REAL, PEOPLE! As I read, there were “AH HA” moments, and “YES! THIS” moments and…I laughed. This isn’t a clinical marriage book. It’s more like having a conversation with friends. If your marriage needs a restart or is struggling…if your marriage is strong…even if you’re not yet married, but plan to be in the future, this book is for you. There is always room for improvement, right?! And there is never a better time than before you get married to have a mindset of TEAM US before you jump in. Believe me, going into marriage with a one-flesh perspective makes the road ahead doable…more than doable, it’s successful. Before you run out and purchase your copy...I’m giving away a FREE ONE! WOO-HOO! Just leave a comment about what you love about your marriage (if you’re married) or what you hope your marriage will look like some day. Share on social media to earn more entries. You can even subscribe here for another chance to win. Good luck in the giveaway and may YOUR Team Us be Successful! Be sure to tag #marriagetogether as you read and share!